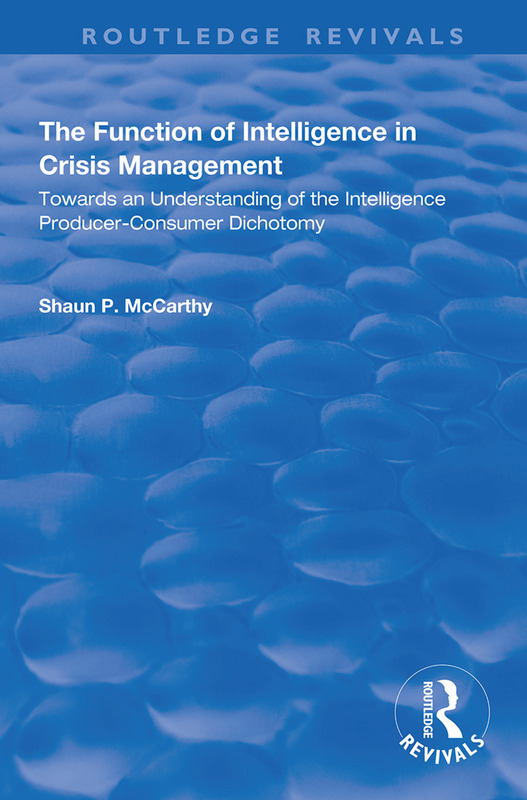 First published in 1998, this work is a study of the relationship between intelligence and policy and focuses on the function of intelligence in crisis management. It provides an integrated approach to the theory of the intelligence process and the principles of crisis management. It identifies those factors that influence the producer-consumer relationship within the context of the Traditionalist vs. Activist approaches, i.e. The Kent-Kendall debate. New insight into the practical limitations of the Traditionalist approach to intelligence is provided. Using terrorism as a crisis phenomenon, the study analyses the function of intelligence and the reasons behind the intelligence and the reasons behind the intelligence failures during the Reagan Administration’s Foreign Policy initiatives in Lebanon, 1981-1985. With its focus on intelligence theory and management, as well as crisis management and policy making, this book will appeal to academics, scholars, intelligence practitioners, historians, policy makers and business management professionals. Although the work focuses on the U.S. intelligence community and the behavioural trends within American intelligence and security organisations, the principles and lessons learned can be applied to business and government in other democracies.